The Houston Astros take on the Los Angeles Angels on Friday at Angel Stadium. The Astros send Dallas Keuchel to the mound to face Jered Weaver of the Angels. The opening line for this matchup has Houston at -118 and Los Angeles at +108. The over/under was set at 7. The Astros have a 63-71 over/under record and a 75-65 run line mark, meaning they cover 54% of the time. The Angels have a 66-68 over/under record and a 60-79 run line mark, which means they are covering the spread 45% of the time. The Astros show up with a 76-64 record, including 28-40 on the road. Dallas Keuchel has an earned run average of 2.29 and is 17-6 so far on the season while having a 0.99 WHIP. He's pitched 200.2 innings thus far while surrendering 155 hits over that time and when he starts, the Astros are 20-8. The Astros are also 13-15 against the over/under in his starts. His teammates are averaging 5 runs a game when he pitches. The bullpen has an earned run average of 2.95 and they have given up 301 base hits on the year. The bullpen has struck out 401 and walked 119 batters this season while opposing teams hit .205 against them. Houston has a team average of 7.98 hits allowed per game and are averaging 7.92 strikeouts per nine innings. With a team earned run average of 3.41, they are 5th in the league. Houston ranks 28th in the league in team batting average at .245 while hitting .241 on the road. The Astros hold a .425 team slugging percentage and an on-base percentage of .310 which is good for 23rd in baseball. With 167 hits, Jose Altuve leads the team while his team ranks 28th in hits per game with 8.21. Los Angeles is 42-30 at home while holding a 70-69 overall record on the season. Jered Weaver is starting this game 6-10 for the season with an earned run average of 4.78 and a WHIP of 1.23. He's pitched 131.2 innings thus far while surrendering 137 hits over that time in which the Angels are 9-12. The Angels are also 9-11 against the over/under in his starts. His teammates score an average of 3.2 runs a game when he pitches. The bullpen has an earned run average of 3.74 and they have given up 379 base hits on the year. The Angels bullpen has struck out 359 batters and walked 135 this season while opposing teams have hit .244 against them. Los Angeles has a team average of 8.16 hits per game and are averaging 8.76 strikeouts per nine innings. With a team earned run average of 3.39, they are 3rd in the league. They rank 19th in the league in team batting average with a .252 average while hitting .256 at home. The Angels hold a .417 team slugging percentage and an on-base percentage of .328 which is good for 2nd in baseball. 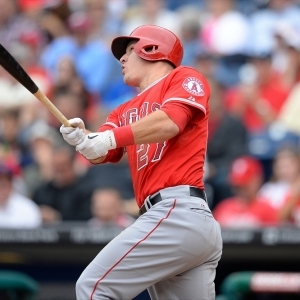 With 144 hits, Mike Trout leads the team while his team ranks 26th in hits per game with 8.35. Houston has a team fielding percentage of .987 after having committed 66 errors with 1,422 assists and 3,752 put outs for the season. Over the course of this season, the Angels have accumulated 80 errors while having 1,276 assists and 3,710 put outs leading to a .984 fielding percentage.